Myrtle Beach Mayor Brenda Bethune announced this morning that Darius Rucker will have a special guest appearance during the upcoming Hurricane Florence Benefit Concert. Rucker, originally from Charleston, South Carolina is a singer/songwriter known as the frontman of the musical group Hootie & the Blowfish who transitioned to a solo country artist in 2008. 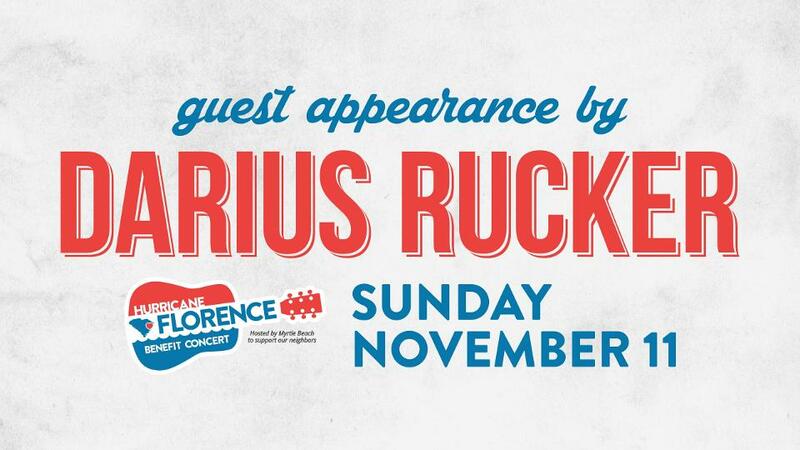 The concert, which will take place on Sunday, November 11 at TicketReturn.Com Field, also features Michael Ray, Carly Pearce, Love and Theft, Chris Bryant, Josh Phillips, The Davisson Brothers Band, The Swon Brothers, and The Blue Dogs. Additional artist announcements are expected in the coming days. Tickets for the event begin at $50 and are available at myrtlebeachpelicans.com/concert. All proceeds from the event will go to the Area Recovery Council through the Waccamaw Community Foundation to support disaster relief efforts in Horry and Georgetown counties, as well as the Eastern South Carolina Chapter of the American Red Cross to support disaster relief efforts in the counties of Horry, Florence, Darlington, Marlboro, Dillon, and Marion. To learn more about the Waccamaw Community Foundation click here. To learn more about the Eastern SC Chapter of the American Red Cross click here.